Sign Up for One-Day Registration at CBAI’s 43rd Annual Convention! Community Bank Customers Searching for Answers: Where Can They Turn? Blockchain, Artificial Intelligence – Beneficial Ownership! Governor Rauner has now signed all four of CBAI's legislative initiatives that passed the General Assembly this spring. The Governor signed the last initiative, HB 759, on Friday, August 25. CBAI thanks Governor Rauner and all the bill sponsors for their hard work and support in the passage of these bills. See Synopsis and Links to Bills. Busy schedule? Sign up for a one-day registration at CBAI’s 43rd Annual Convention, on either Friday, September 15, or Saturday, September 16, at the Crowne Plaza in Springfield. Friday’s schedule includes the Opening Breakfast with renowned speaker and author John O’Leary; the Business Meeting Luncheon features ICBA Chairman Scott Heitkamp, 10 education break-out sessions including expert speakers on the hottest topics in community banking today, 90-booth exhibit hall, and a recognition event for CBAI President Bob Wingert, who retires at the conclusion of 2017. Saturday’s schedule begins with a Continental breakfast in the Exhibit Hall, jammed packed with the latest in products and services for community banks; 10 more timely break-out sessions, a Report from Congressman Rodney Davis, and a Closing General Session with professional speaker and generational expert Jeff Havens. You can also register to attend the education and exhibit hall only, which excludes meal functions, for just $209 per day! As a reminder, the deadline for hotel reservations is Tuesday, September 5. Call 217/529-7777 or 877/270-1393 today to book your room at the special rate of $135 plus tax for single or double. Don’t let your busy schedule keep you from attending CBAI’s showcase event! One-day Registration. Full Convention Details. Community bankers are reaching out to support the thousands of community bank employees and their families impacted by Hurricane Harvey. ICBA, in partnership with MainStreet Bank in Fairfax, Va., has launched the Hurricane Harvey Community Bank Relief Fund donation portal via Aircharity® through which community banks can send financial resources directly to banks in affected regions. MainStreet Bank will cover service charges, so 100 percent of the proceeds can go to support the cause. Donate to ICBA Community Bank Relief Fund. Last week the Independent Community Bankers of America released “ICBA Principles for Tax Reform,” a white paper detailing the association’s principles and recommendations for reforming the nation’s tax code. CBAI supports the plan and is calling on Congress to modernize and simplify a complex and inefficient tax system by enacting tax reform measures that strengthen communities, promote local economic growth and spur job creation nationwide. See Release. 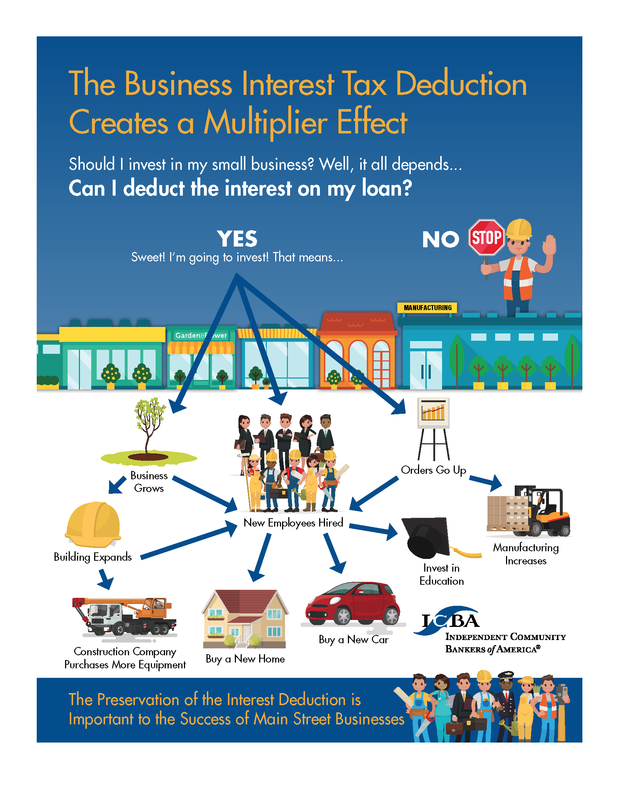 See ICBA’s Infographic. Read White Paper. You asked. SHAZAM listened! You can now add the transaction blocking and alerting functions of our SHAZAM® BOLT$TM mobile app into your own mobile app. You no longer need to use two apps to get this fraud-fighting feature. With these transaction level blocks and alerts, your chances of fighting and stopping fraud just increased exponentially! Your cardholders know their own spending habits better than anyone else, and they’ll enjoy having more control over their cards while you’ll enjoy saving time and money. Proactively fight fraud together. Learn More Today! Banking agencies announced plans to develop a proposal that would simplify capital rules to reduce burden for community banks. With respect to those banks not subject to the advanced approach capital rules, the agencies also proposed postponing the full implementation of Basel III capital standards and risk weighting requirements for mortgage servicing assets, certain deferred tax assets, investments in the capital instruments of unconsolidated financial institutions, and minority interests. ICBA previously filed a comment letter requesting regulators to pause the full implementation of Basel III capital standards on MSAs calling them “unduly punitive” and warning on the potential costs to consumers and impact on MSA liquidity in the market if enacted. Read Release of Banking Agencies. See ICBA Comment Letter. Read ICBA Release. Tom Hoenig, vice chairman of the FDIC and long-time advocate for regulatory relief for traditional banks, expressed concern that the Volcker Rule continues to be characterized as a burden to community banks when it is not. He noted this week that the Volcker Rule neither favors nor disfavors community banks. It prohibits all FDIC-insured banks and their affiliates from investing in hedge funds. It was adopted because during the last financial crisis banks of all sizes experienced significant losses from investments in complex, unregistered on- and off-balance sheet funds. It is common knowledge that these losses seriously impacted the Deposit Insurance Fund. Hoenig emphasized that, If the fund were used to protect deposits that underwrite such activities and their unique risk, it would require a significant increase in insurance premiums to account for such risk. Since all banks would share such a premium adjustment — thereby shouldering the risk of the few institutions making these types of investments — this seems unwise. CBAI concurs. Read More. Community banks will continue to fight to preserve the historic separation of banking and commerce, ICBA President and CEO Cam Fine wrote in a recent op-ed. In American Banker, he emphasized that allowing nonbank corporate conglomerates to own banks jeopardizes the impartial allocation of credit, creates egregious conflicts of interest, and results in a dangerous concentration of commercial and economic power. Fine also pointed out that it also extends the federal safety net to commercial interests, which is counter to the principles upon which the FDIC was created. “Mixing banking and commerce wasn’t a good idea in 1929, 1999, 2006 and 2009, and it’s still not a good idea in 2017.” Read Fine’s Op-Ed. Return on assets for the industry was up 1.14 percent, from 1.06 percent a year ago. Community banks’ ROA was 1.04 percent, up from 1.00 percent a year earlier. Community banks’ net interest margin was 3.61 percent, but their advantage over large banks is narrowing. Half of their assets mature or reprice in three or more years, leaving community banks vulnerable to interest rate risk. Loan growth at community banks remains strong, at 2.7 percent in the quarter and 7.8 percent compared to a year ago, while small business loans rose 2.7 percent during the past year. See FDIC Quarterly Banking Profile. View FDIC Archived Webcast. We all know how it is with monetary policy; timing is everything. Itmay be somewhat telling, and perhaps apropos, that Kansas City Fed President Ester George’s timing was a little off in the planning of her celestial watch party. Mrs. Yellen spoke recently in Jackson Hole on the topic of financial stability because, well, she can’t really talk about inflation, can she? Rising asset valuations and the lack of volatility have many Fed officials concerned that complacent investors are failing to see the potential risks lying in wait. See Baker Market Update. A record 150 bankers and guests crammed into a packed room at Illini Country Club in Springfield to hear noted economist Lacy Hunt, Ph.D., talk about factors affecting the economy and interest rates. Baker analysts reviewed investment strategies and products appropriate for a community bank portfolio. After lunch, more than 100 attendees participated in the annual Baker Golf Outing at Illini Country Club, a US Open qualification site. Read More. Creighton University’s Rural Mainstreet Index continued to experience weak growth of 42.2 in August and 40.7 in July, the index’s lowest level since November 2016. On average, bankers expect farmland prices to decline by another 3.5 percent during the next year. This is an improvement from this time last year when bank CEOs projected a 6.9 percent decline. Bank CEOs were asked the value of cash rents for cropland in their area, and bankers reported a yearly cash rent of $241 per acre, down from $252 per acre one year ago, or 4.3 percent. Land values are below growth neutral for the 45th straight month. Approximately 58 percent of bankers reported drought conditions having a negative impact on production in their area. See Mainstreet Economy Release. In a letter to House Judiciary Committee Chairman, Bob Goodlatte (R.-VA), Assistant Attorney General Stephen Boyd confirmed that the Department of Justice has closed down all its initiatives that formed part of Operation Choke Point. Operation Choke Point ostensibly used legal and regulatory pressure to “choke off” the financial oxygen for businesses that were exploiting consumers. In fact, the operation had a far wider effect. Early subpoenas issued to banks had attached a guidance document from the Federal Deposit Insurance Corporation (FDIC) that warned banks to consider “reputational risk” in their banking relations. His letter was followed up by another from Acting Comptroller of the Currency, Keith Noreika, to House Financial Services Committee Chairman Jeb Hensarling (R.-TX) that welcomed the DoJ’s confirmation that Choke Point was over. He indicated that OCC “rejects the targeting of any business operating within state and federal law as well as any intimidation of regulated financial institutions into banking or denying banking services to particular businesses.” Read More. Banking consultant and attorney Jeff Gerrish has identified 10 separate strategies that a community bank board of directors should consider to remain independent in a consolidating environment. Read More. According to marketing analyst Rob Heiser, today’s community banks have a tremendous opportunity to leverage their data and provide scalable, personalized messages to help each customer navigate their own unique financial journey. A 2017 Consumer Bank Marketing Report conducted by Segmint found that 92 percent of community bank customers trust their bank to protect their personal information, compared to just 85 percent of customers of big national banks. Community bank customers trust their banks, and they want more advice from them. As a result, community banks have a tremendous opportunity to become a true partner to their customers. Read More. See Marketing Report. Wolters Kluwer Financial Services, a CBSC preferred provider, will cover those plus many, many more hot and upcoming topics at its inaugural 2017 Banking Insights Virtual Summit taking place this coming October 11 and 12! No wasted time in sessions you don’t care about! You pick the sessions that impact you! In ICBA Bancard President and CEO Tina Giorgio’s latest blog post, the former community banker weighs in on what she considers to be the best-in-class P2P solutions in the marketplace today and explains why community banks should embrace this popular way consumers are transferring money. Read Tina's Take on Payments. Regardless of which direction the regulatory pendulum is swinging, bankers should seize this moment to focus on something critically important: building sound relationships with regulators. Risk advisor John Carey offers some time-tested best practices that will make a difference. Read More. In recent years, employers (including employers of mortgage loan originators) have seen Executive Orders and Department of Labor interpretations that have expanded the instances in which employers were obligated to pay overtime. With that in mind, it was a somewhat refreshing change when the U.S. Court of Appeals for the Seventh Circuit recently ruled that an employer is not obligated for overtime hours of which the employer was unaware. See Most Recent CBAI LEGAL. The National Flood Insurance Program, operated by the Federal Emergency Management Agency, is set to expire at the end of September. Bipartisan bills in Congress under consideration would extend the program, with potential substantial changes. Read More. Small business is actively looking for lending and deposit alternatives, often with a non-bank. This engaging seminar looks at the ways a community bank can find small-business loan and deposit opportunities and find them faster than your competitors. The first strategy is to generate more small-business loans and deposits from your existing customers. The second strategy is to take opportunities from your competitors. This seminar focuses on tactics that help you discover, qualify, and take all available loan and deposit opportunities. The program focuses on the concepts of identifying opportunities, deciding which businesses make sense to work with, and which businesses you might consider for specialization. Leading this seminar is Duane F. Sobecki, CEO of Focused Results, LLC, a sales strategy, consulting, and training firm. In the ever-changing world of ACH, it is difficult to stay abreast of the risks involved and the ever-changing rules. The presentation gives community banks ideas for reducing risk and improving compliance. The ACH-Rule changes that are effective from 2016 – 2018 are also explained in a practical, easy-to-understand approach. Nicole Meinhardt, CPA, AAP and senior manager at Wipfli LLP, Sterling, IL, leads this seminar. The role of the personal/universal banker has been enhanced with the advancement of technology, but the customer emphasis has changed to relationship from transactions. Universal bankers used to enjoy a steady stream of customers at our branches. Now, most of us have peak periods when customers crowd our lobbies, but there are very real lulls during the business day that we need to fill with meaningful activity. The levels of professionalism and commitment for us as universal bankers have never been as high as is required in today's banking environment. We're ready for the challenge, and this lesson highlights the journey of our continued skills development as we serve our customers and grow the bank. Jennie Sobecki, co-owner of Focused Results, a company concentrating in results-driven process consulting and training experience in community banks and financial institutions leads this program. © 2016 Community Bankers Association of Illinois. All Rights Reserved.